At Millstone Custom Homes, we have built a reputation of being honest, reliable and delivering quality custom home and remodel construction that exceeds our clients’ expectations. We have more than two decades of design-build experience. We approach every project with passion, professionalism and a high level of expertise. Our process sets us apart from other homebuilders. We serve as your trusted partner, we can help you every step of the way, from selecting the right lot, to the design and construction of your new home. Building your dream home is something you may only do once in your life. We are here to help make it as stress-free and fulfilling as possible. The way we do business is uncommon in our industry. But it’s exactly what our clients love about working with us. Many builders price by the square-foot. That’s not us. We believe construction of a custom home calls for more detail and consideration than square-foot pricing. As your trusted building partner, we will work with you to develop a plan and a budget that delivers the quality custom home you’ve been dreaming of at the price you expect. Perhaps your dream design is beyond your budget? Value engineering is a process we provide. We will work with your design plan to find efficiencies and other solutions to help you get what you want at a price you can afford. We work with the best construction professionals in the region, and have developed long-standing relationships with them throughout our years in business. We will be out on your job site regularly, conducting quality checks and staying on top of your project’s progress. Sam Clifton is a second-generation builder. 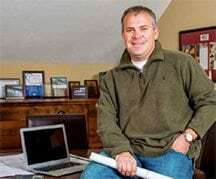 Growing up, he learned every aspect of the business while working in his father’s construction company. Sam formalized his education with a Bachelor of Science degree in Construction Management from Missouri State University. In 2004, he and his wife, Michelle, started Millstone Custom Homes to pursue their passion of building custom luxury homes in Southwest Missouri. 2012 Design Excellence Award Winner by Residential Design + Build Magazine for Custom Home Development; Development included custom homes and infrastructure (streets, sewer, utilities, and landscaping). Selected by ABC television’s Extreme Makeover: Home Edition as Lead Builder for two episodes, one in 2009 and the other in 2011.